Gu - dark gooey attachment. Roo - a (liberating) ray of light. The word guru refers to a religious guide or teacher guide. Waheguru means wondrous enlightener. The Sikh scripture Guru Granth teaches that with grace, salvation may be attained by meditating on Naam, or the identity of the divine enlightener. Sikhs are encouraged to remember God always, by a method known as simran. Instruction is given during initiation at the time of baptism to recite Gurmanter, a term which means mantra of Waheguru. Gurmanter is to be recited as a meditation in the Amritvela early morning hours, and also throughout the day. 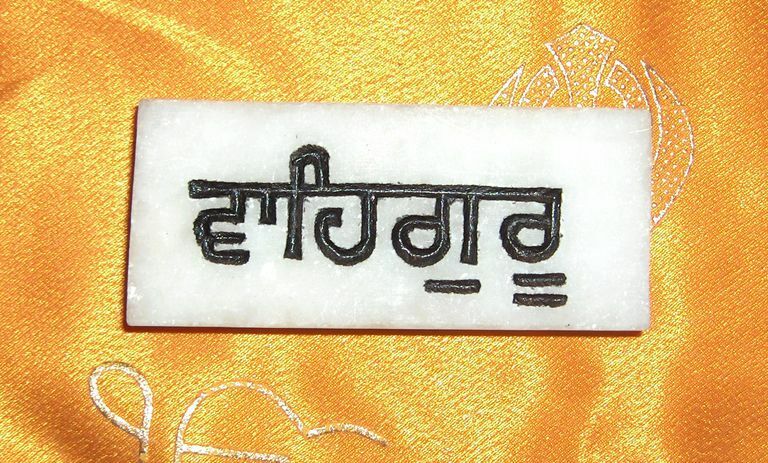 Vaahi gu roo: The Gurmukhi letter for W is close to the sound of V and is pronounced with the teeth touching the lower lip. Waahe Guru, Waahe Guru, Waahe Guru, Waahe Jee-o. Lotus-eyed, sweet of speech, exalted and embellished with millions of companions, Mother Yashoda invited Thee [as Krishna] to partake sweet rice and curd. Seeing Thy supremely beautiful form, and hearing the musical tinkling of Thy silver bells when Thee played, intoxicated the mother with loving delight. Death's pen is commanded by Thy hands, who can erase Thy writ? Shiva and Brahma meditate yearning to enshrine Thy spiritual wisdom in their hearts. Sikhs are ultimately meant to contemplate Waheguru with every thought, deed, and breath.